My bestie Shannon Christy, we all know she's waiting for us up there. I chose this life. I did. I have to remind myself of that, one, simple, fact. I chose this life that I live. This life, ever changing, always moving, never home, living out of a Watershed Drybag, taking showers in downspouts during rainstorms, laughing hysterically on the river, crying while remembering lost friends, loving every day like it may be my last. Since March 22, I have spent 19 days at home with my fiancé. I have also flown to Portland 3 times, flown to DC, driven to Colorado, flown to Asheville, driven to the Nantahala Outdoor Center four times, spent at least 10 nights on a couch, 3 weeks in a king sized bed at the Watershed Cabins, 5 nights in a king sized bed in Vail, and so many other nights in random rented houses or hotel rooms. I have taught 46 young adult cancer survivors how to kayak and just finished a week long kids camp with the NOC, working with 8 kids on the water. I don't always know when my next meal will be, or from where it will come. Some of my clothes smell like mildew even though I have washed them, multiple times. Some days are harder than others. Travel days stress me out, doing laundry is always complicated; “Is this clean? Does this smell?”, I even forgot every piece of my insulation layers to go to Colorado. It seems like there is no end in sight with this crazy life. I have one more week in Hood River working for First Descents, a week in Michigan (resting hopefully) with my family and my new niece, then home to Greenville for a week. 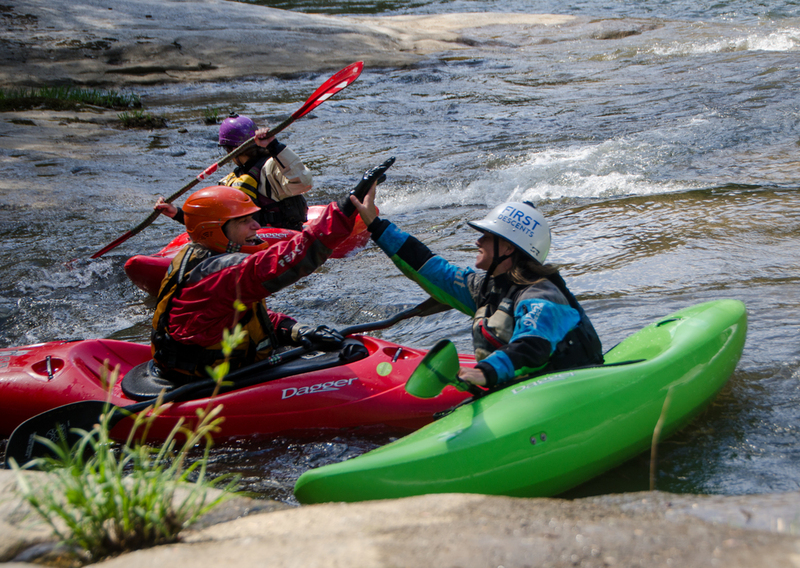 Only to go back on the road one week later to teach more clinics at the Nantahala Outdoor Center. As I reflect on the last 14 weeks, I also remember all of the life changing times I have had. I have met people and created new relationships, I have had experiences I would never dream of missing out on. I have felt joy, sorrow, happiness, worry, and comfort. When I tell people about my life, my jobs, my adventures, they hear all of the positives. They don't hear about the 8 minute connections running through the Atlanta airport, or trying to pack for a month after only being home for 5 hours, the hardship of constantly being in and out of a community, or being apart from my human for so long and how challenging that is. Luckily, the friends I have chosen support me, my fiancé supports me, my family supports me, my community supports me. The life I have chosen is not the easy life, but it’s the one I chose and I would never change it. Cheers to the next adventure, right around the corner. Thanks for being there with me!